Has Olympus E-M1 ended DSLR history? Olympusu2019s DSLR days may be over as the firm unveils the OM-D E-M1, a compact system camera designed to optimise AF for micro four thirds and four thirds lenses. Developed as a successor to the Olympus E-5 DSLR, the E-M1 is designed to be used with four thirds lenses via a £179 adapter, which Olympus has pledged to give away free to existing E-system camera owners. The E-M1 is designed to be compatible with 63 existing Olympus lenses (the current E-M5 will continue). The move comes a year after Olympus said it was working on a body to ‘fully utilise’ the focusing performance of its four thirds lenses after years of speculation over the future of its E-system. Olympus said it was responding to calls from E-system devotees who wanted to make the most of their ‘high-grade’ lenses. There are tens of thousands of four thirds users worldwide, estimates UK consumer products marketing manager Mark Thackara who said Olympus has been working on the project for three years. Housed in a ‘rigid magnesium body’, the E-M1 boasts Olympus’s ‘fastest ever’ AF system, called Dual Fast AF. ‘The camera detects which sort of lens you are using and switches automatically to the more suitable AF technology either phase detection [for four thirds] or contrast AF [micro four thirds],’ explained the firm in a statement. However, the E-M1 will not detect the type of AF that should use if a non-Olympus lens is attached. The newcomer features a new 16-million-pixel Live MOS imaging sensor, a ‘next generation’ TruePic VII image processor, plus a tilting 3in monitor. Also in board is 5-axis image stabilisation and a top ISO is 25,600. The E-M1 features a 2.36m-dot EVF the brightness of which can be set to automatically adjust according to change in light conditions. Users can tailor the EVF display to suit their own colour preferences by adjusting hue and saturation levels via four pre-sets. 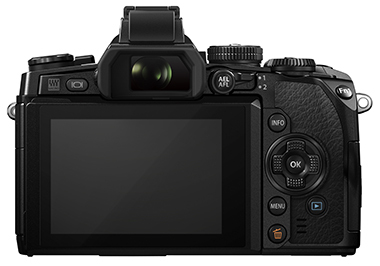 The E-M1 is the first Olympus camera not to feature a low-pass filter on the sensor, a move also adopted by other camera makers to help boost image quality. Olympus claims that it has improved noise reduction in the E-M1. Firepower also includes built-in Wi-Fi, enabling remote control using a smartphone, for example, a burst rate of around 10 frames per second shooting, plus 12 art filters. An HDR preview mode aims to allow users to monitor HDR images in the EVF before shooting and see the effects of changes to highlight and shadow, and colour. Olympus claims the camera can operate in temperatures down to minus 10° C and is dustproof and splashproof. 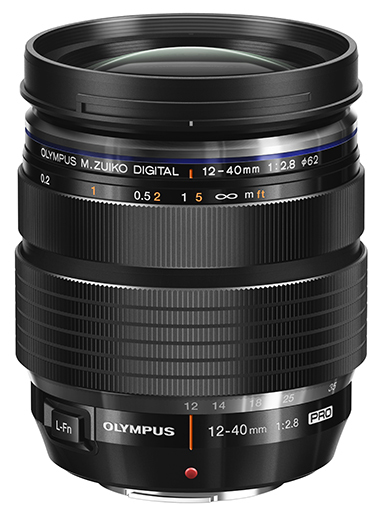 To coincide with the launch Olympus has revealed a new 12-40mm f/2.8 M.Zuiko Digital ED lens [24-80mm equivalent]. It has also announced the development of a 40-150mm f/2.8 zoom expected to go on sale by the end of next year. The E-M1 is due out in mid-October, priced £1,299 body-only and £1,949 with a 12-40mm f/2.8 lens. Customers who pre-register before the camera goes on sale can claim a free HLD-7 vertical grip. Last year Olympus said it was delighted with the success of the OM-D but acknowledged that it did not deliver with the legacy high-end lenses from the E-system.